Here is a neat animation of the forecast, showing not only the Earth, but Mars, Mercury and Venus as well as a few spacecraft in orbit. The cloud is expected to hit here on Saturday, around 22:30 UT (plus or minus 7 hours). (The Space Weather Prediction Center has forecast that it will hit at high northern latitudes around 1:00 p.m. EST on Sunday, with the bulk of the disturbance on Monday.) Initially there were apparently fears that this would be a direct blast that could seriously threaten communications and satellites, but the Post reports that it is more likely going to be a glancing blow affecting high latitudes. It will reach Mars on January 24th. 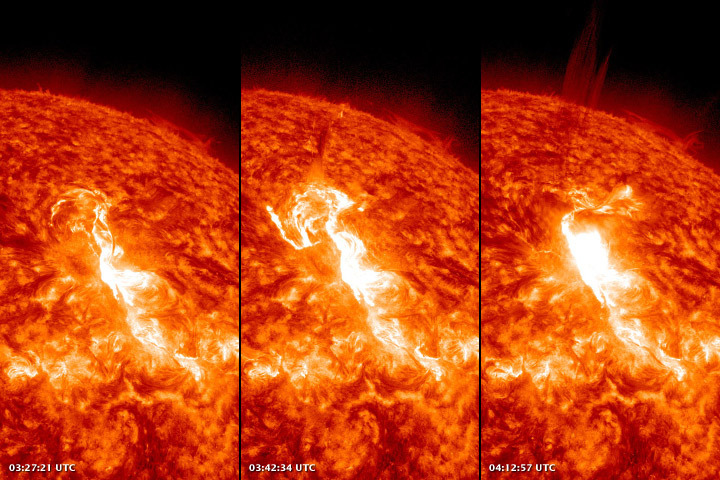 We are heading toward a sunspot maximum in 2013, and sunspot activity and flares like this may increase. Another consequence of increasing sunspot activity is that the UV radiation levels increase from the sunspots. This activity "puffs up" the earth's atmosphere which puts drag on low-altitude space debris, causing it to slow down and eventually fall out of orbit. Space debris has become a major concern for safety of the astronauts in orbit, and getting rid of some of it in this way is a good thing. I hadn't been aware, but in 2007 the Chinese "killed" one of their weather satellites in a test, creating over 3,000 pieces of debris bigger than golf-ball size. Only 6% of this debris has re-entered the earth's atmosphere. There was also a collision of Cosmos 2251 and Iridium 33 satellites that created debris. Could be some good aurora somewhere! As an island nation, England has had a long tradition of strong navy ships, but ship casualties at sea were high, not just because of battle and pirates, but because of poor design. 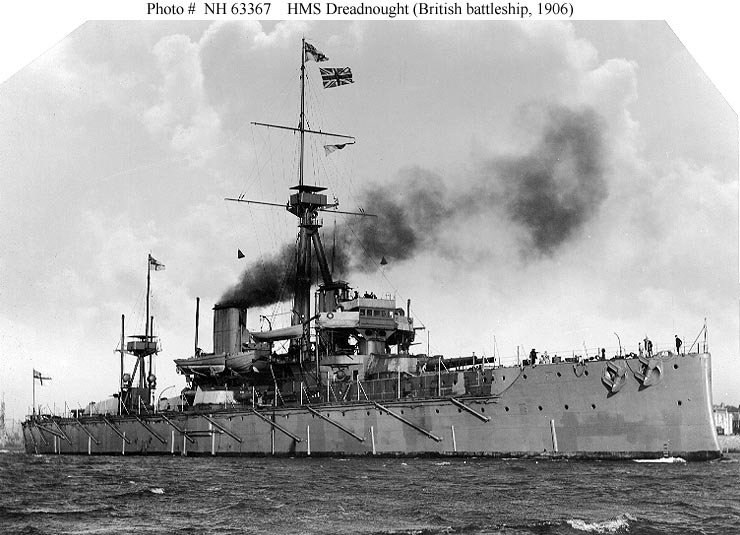 The Victorian Age was also the age of the ironclads--massive heavy ships. One such ship was the "Captain", which turned turtle in 1871 with the loss of almost 500 lives. A father-son team, William and Robert Froude had been working on ship design and had been conducting experiments with small ships on the River Dart, and later had built their own testing tank at Chelston Cross. ** When the Captain turned turtle, Froude gained support (an enormous sum of 2000 pounds!!) to cover the cost of building a tank in which he could test scale models of ships. This was to revolutionize ship-building, a practice that until then had been done by simple reliance on the experience of shipwrights. William Froude died in 1879 at the age of 69, and a few years later the original experimental tank (called the Torquay tank) became obsolete. Robert Froude built a new tank, 475 feet long, 20 feet wide, and 9 feet deep at Haslar. By 1918, over 500 warship models had been tested there, including the "Dreadnought," a revolutionary battleship that rammed and sank the U-29 German submarine during World War I. At low Froude numbers (low velocity and/or big long ship) viscous resistance dominates. At Fr=0.4 to 0.5, wave resistance dominates. Most conventional ships operate at Fr<0.4. **Here's the reference on the two Froudes. Here's a source of some of the other information that I used here. As searches continue for more victims in the submerged parts of the Costa Concordia, salvage operations are also beginning. It appears that Dutch Smit and Salvage is doing the salvage. (Dutch salvagers have long dominated the trade because of the expertise with pumps developed to keep The Netherlands dry.) They have equipment in place already to keep track of the ship's movement, and equipment to begin transferring fuel out of the ship could be ready to proceed on Wednesday (the 18th). 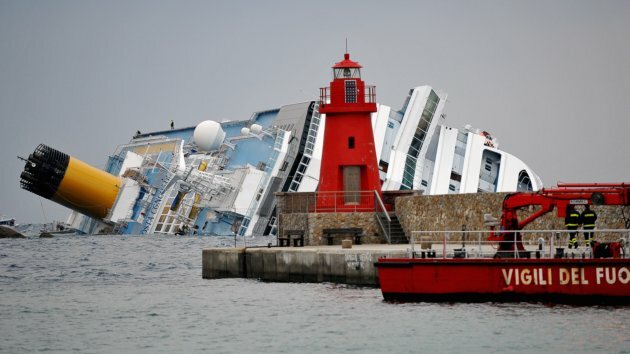 The Concordia is nearly twice the size of the Titanic, and salvage operations will be fascinating to follow. The Cougar Ace was 654 feet long, and had 23 people on board. 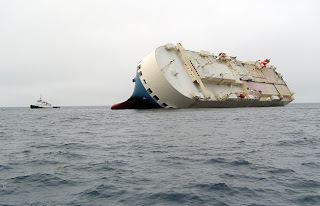 Marine salvage law is complex, and perhaps a reader would like to comment. I decided, instead, to look at some previous salvage efforts. I found a great article in Wired Magazine in 2008 called "High tech cowboys of the deep seas: the race to save The Couger Ace." The Couger Ace was a deep-sea car transport ship with 14 decks packed with 4,703 brand new Mazdas bound for North America, a cargo estimated to be worth $103 million (for comparison, the Costa Concordia alone is a $500 million dollar ship that was carrying over 4,000 passengers and crew.) The Couger Ace was about 230 miles south of the Aleutian Islands in a heavy fog. The captain and crew started the ballast water taken on in Japan to replace it with local water, a procedure that the US requires to prevent contaminating American marine environments with foreign life. It's a tricky procedure to maintain stability and equilibrium. Something went wrong during the procedure and the starboard ballast tanks failed to refill properly. The ship rolled, and just at the wrong time, a large swell hit and exaggerated the roll. The salvage operation was run by Titan Salvage, led by Rich Habib. The crew of such an operation has a wide range of skills--deep-sea diving, computer modeling, underwater welding, engine repair. A key person on this team is the naval architect capable of building digital 3-D ship models to plan and execute salvage procedures, an approach quite different from the Dutch pumping approaches. Meanwhile, The Cougar Ace was drifting toward rocks on the shores of the Aleutian Islands and was taking on water. The danger was losing the ship, the cars, and 176,000 gallons of fuel in an area of rich wildlife and fishing grounds. The insurers felt that the ship was lost, but then executed a "Lloyd's Open Form agreement" with Titan: if they don't save the ship, they don't get paid. If they save the ship, the compensation is based on the value of the ship and cargo, and is a fortune. The naval architect, Marty Johnson, took a fall and died during the salvage. The crew eventually built a digital model of the ship and developed a plan for shifting water between ballast tanks. You have to read the full (and long) report to get a feel for the difficulties of the operation. Bottom line is that although they righted the ship and saved all the cars, they had sat at a 60-degree angle for two weeks and Mazda couldn't be sure that there wouldn't be problems. Would the air bags function properly after such an event? Will the engines live out their warranty? After a year, 4,703 Mazdas were loaded one-by-one onto a converyor belt that removed them from the ship and dropped them into a "Texas Shredder," a 50' tall machine that smashed each car to small chunks.